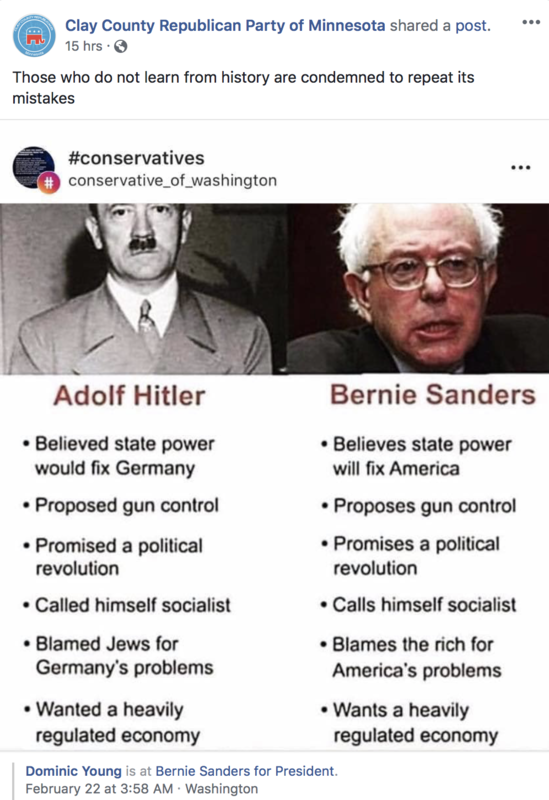 The Clay County Republican Party of Minnesota shared and then deleted a photo that compared Independent Vermont Sen. Bernie Sanders to Adolf Hitler on Monday afternoon. The recent post that was shared by a volunteer on the Facebook page for the Clay County Republican Party has been taken down. Whether it’s the Democrats comparing Donald Trump to Hitler or Republicans comparing Bernie Sanders to Hitler, it is wrong, stupid, and inappropriate. We sincerely apologize. Andy Hollinger, the Communications Director of the U.S. Holocaust Memorial Museum, previously directed The Daily Caller to an article they published on the increase in comparisons made between the Holocaust or Hitler and a political opponent. Editor’s note: The story has been updated to include a statement from the Minnesota GOP.